You can use a cable machine to work your oblique muscles. You can do regular crunches with a cable machine or resistance bands, and you can also do oblique cable crunches. 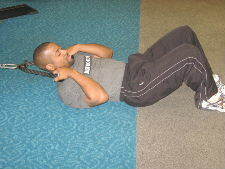 Below are pictures for oblique cable crunches on the floor. Starting Position: Attach a rope or two handles to the bottom part of a cable machine. Lie on the floor in the crunch position and grab the handles or rope so that it is over your head. Form: Exhale and crunch your body forwards like in a regular crunch, but as you get to the top rotate your body so that one elbow moves towards the opposite knee. Hold briefly at the top and slowly lower to the starting position. 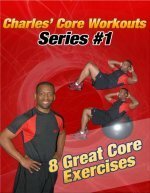 Personal Trainer Tips: You can do this exercise 2 ways. You can do all the reps on one side and then switch to the other side, or you can do it by alternating sides. This can be a tricky exercise to master because the range of motion is so small for many people. Move in a slow and controlled motion. If you want more range of motion try this oblique exercise on a stability ball. This is just one exercise for your obliques. If you don't have access to a cable machine try another exercise for your oblique muscles. But remember that oblique exercises by themselves won't get rid of your love handles or give you a 6 pack. If you want to lose stomach fat you must take a comprehensive approach to fitness and health. Try some of the weight loss tips and diet tips on this site, or read about getting a flat stomach and 6 pack abs.